Sorority Noise’s Cameron Boucher is no stranger to recording and releasing covers, be it under his own name or with one of his bands. Today, Boucher released a cover of Brand New’s “Me vs. Maradona vs. Elvis” from the band’s 2003 album Deja Entendu. It’s the kind of stripped-down cover one would expect from Boucher but, more importantly, it’s also used as a means to get people donating to the ACLU at this most critical time. 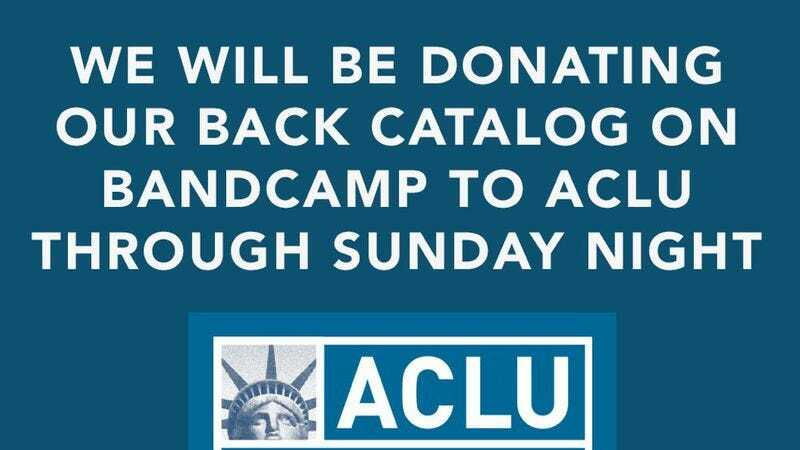 Through Sunday night both of Boucher’s bands—Sorority Noise and Old Gray—will be sending all proceeds from sales on their Bandcamp pages to the ACLU. In addition to that, Boucher is playing a benefit show along with Jeff Rosenstock, Ben Hopkins of PWR BTTM, and Eskimeaux at The Gateway in Brooklyn with all money going to the Council on American-Islamic Relations with a multi-tiered level of donations. Boucher also made the following statement about why his bands are taking action. We as a band can not remain silent in these times of bigotry and racism. We stand in solidarity with our Muslim friends, and against the authoritarian tactics meant to divide us. In noting the outreach platform that we’re fortunate to have, we are making all of our music “pay what you like,” and will be directing all donations to ACLU. Please donate if you can, and please call your local representatives (searchable here: http://www.house.gov/representatives/find/) to voice opposition to the executive branch’s orders and help make a change. There’s so much we can all do, this is just the start.